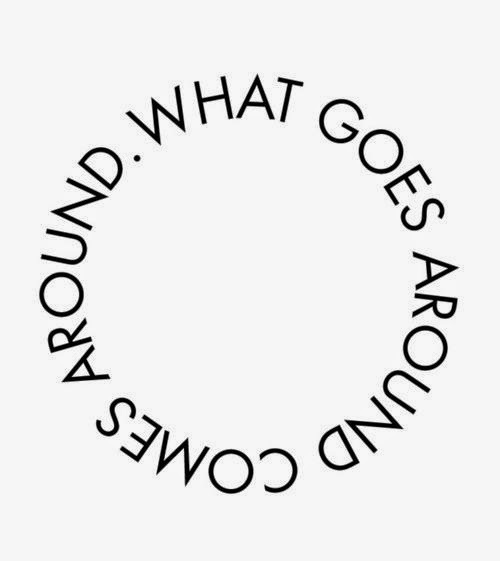 What goes around comes around is one of my favourite quotes. Its one of those sayings that always gets thrown around in my family. Such as when we are annoyed with one another it may get said in anger or some times as a joke to wind each other up but its just always there. I truly believe in this as i think it keeps me quiet positive about most things. I always like 'everything happens for a reason; and I think these two go hand in hand. This year I haven't been feeling the happiest about life and I have had a lot of stress but I always keep these quotes in mind so that I don't become too fed up. On a slightly happier quote i also love these.. I think this is a fun little saying meaning if lives not going right spin your self in a different direction and take a different approach. I think this is defiantly something to live by. Stop saying No and start saying YES! I love this quote its from Alice in Wonderland. I would like this Tattooed too.